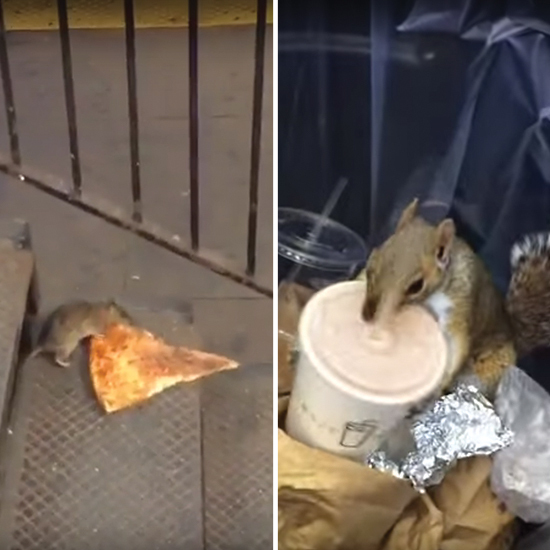 So, Who’s Actually Better: Pizza Rat or Milkshake Squirrel? If there are two things the Internet loves, it’s food and cute animal videos. And this week they have combined in a couple of truly magical ways. First, there was Pizza Rat: The subway-dwelling rodent who was working hard to drag a slice of New York pizza down the steps at a subway stop. But, its thirst for such things unquenched, today the Internet discovered Milkshake Squirrel. As you can see, the furry little guy is quite the fan of Shake Shack. While we wait for the inevitable emergence of Animal Style Double Double Bunny on the scene, we thought we’d break down the two newest YouTube celebrities to see which one of them actually won the Internet this week. Pizza Rat was pulling something more than twice its size down a flight of stairs. He also managed to do it from the correct end of the pizza (shame on anyone who eats crust first). But he couldn’t quite get his score to the bottom. Maybe he should have picked a handicap-accessible subway station and taken the elevator. Milkshake Squirrel pulled a heavy, mostly full cup of custard out of the trash and then managed to actually get the top off with its mouth. Now, that is worth watching. Someone get this Squirrel a time slot on whichever TV network’s pilots are looking the worst this season. We’ll give Pizza Rat the benefit of the doubt and assume that once those obnoxious voyeurs recording him left he went back for his slice. In which case, it could probably serve as food for days down in his J train burrow. The Shake Shack Shake, while delicious, is not so good for our four-legged friend. We can’t tell what flavor it is, but it probably tops out over 700 calories and once the sugar high wears off, it will leave Milkshake Squirrel in a food coma, making him vulnerable to New York City’s various squirrel predators. I had a pet rat growing up. His name was Snoopy. He was very clean, had red eyes and ran in his wheel. Rats are not cute. Ever. As of this writing, Pizza Rat has 4.9 million views on YouTube in two days. Milkshake Squirrel has 83,000 in one day. The numbers speak for themselves. Presumably, Pizza Rat has one hell of a PR team. I’m sure the people who recorded Pizza Rat were just trying not to startle their new friend, but come on, guys, give us something. If I didn’t know better I would have thought this was the worst ASMR video in history. There you have it: Milkshake Squirrel is statistically superior. But seriously, someone find a bunny in Encino eating an In-N-Out Burger. You’ll be an instant millionaire.